An anchorage is an area that is set aside or used temporarily to secure a boat or ship using its anchor. A mooring is a weight, post or other structure that has been placed on the seabed and is used to secure a boat or ship. 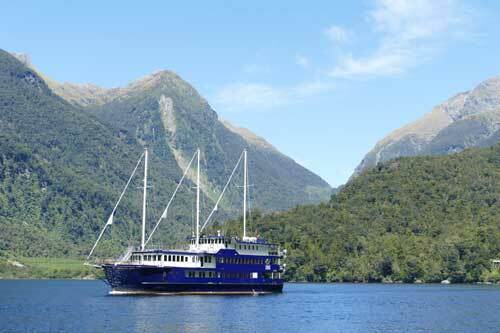 See our Guide to Fiordland (page 84) for descriptions and detailed maps of anchorages, moorings and no-anchoring areas. Avoid anchoring near pest-free islands to reduce the chance of accidentally re-introducing a pest animal (particularly a rat) from your vessel. Commercial fishers maintain most anchorages and stern lines. As a courtesy, make VHF radio contact with the fishers if they are in the area to avoid overcrowding, especially during peak times. See our Guide to Fiordland (page 54) for more information about radio communications. 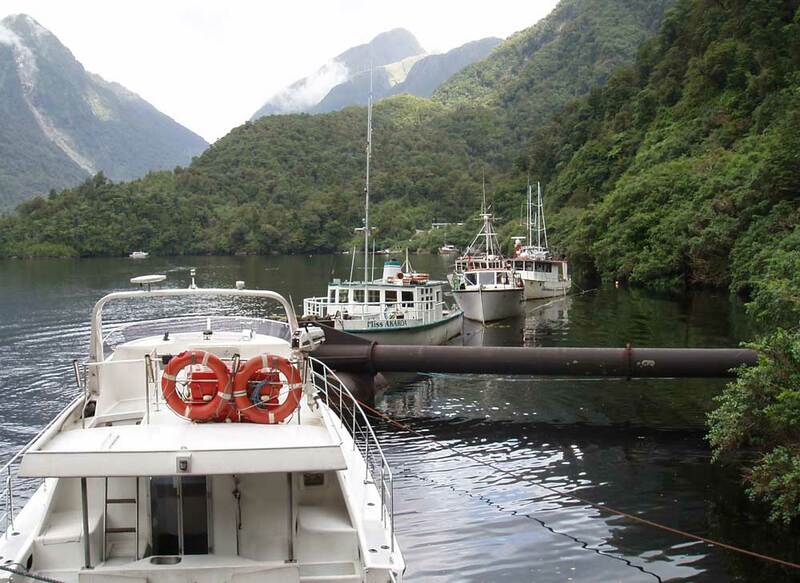 Anchoring in Fiordland, especially north of Doubtful Sound/Patea, often requires using breast lines from the bow and stern lines to the shore. Anchor before dark so you can see the stern lines and mooring lines. Use all the stern lines provided, but check their condition especially in less popular anchorages. The lines may be encrusted with mussels, partially sunken or weakened from chafing. In bad weather, keep your vessel as close to the shore as safety allows. Carry anchoring gear that is suitable for Fiordland. You should have at least 70 m of chain and rope or wire, and a quality anchor with high holding capacity. During light winds, the heads (most landward point) of all the fiords are suitable for anchoring. Take care while approaching to anchor as mud banks in these areas can change the depth from 30 m to 1–2 m depth in a short distance. These small biting insects are extremely annoying near shore in the warmer months when winds are light. Where possible, anchor out from shore at the head of a fiord. A good supply of insect repellent and fitting mesh screens to entrances and windows before your trip is also recommended. Owners have proprietary rights over the mooring block or chain but do not have exclusive rights of the use of a specific area. Owners must make sure that mooring blocks, chains and lines are safe. Owners are responsible for ensuring their use of the mooring does not result in damage to other vessels. Avoid using someone else’s mooring if possible. Owners generally allow others to use a mooring, provided it is suitable for the size of the vessel and is not required by its owner at the time. Environment Southland issues permits for moorings in Fiordland.